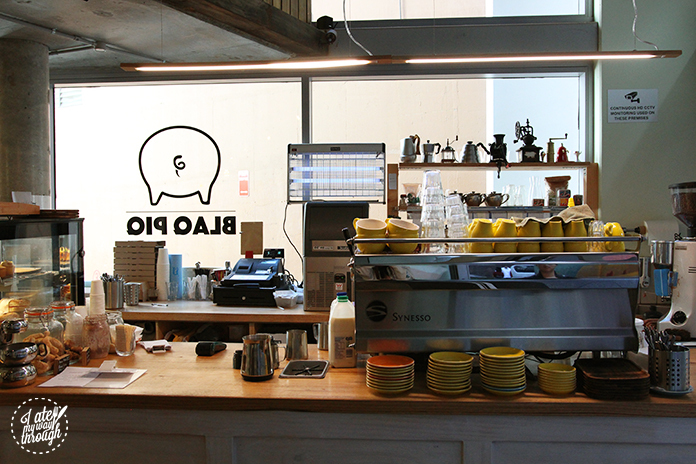 There are so many hidden gems in Sydney’s CBD and Blaq Pig is one of them. Tucked away in Alberta Street near Museum Station, lives Blaq Pig. Black is my favourite colour and I was born in the year of the pig, so I felt an immediate connection to this suave looking café (I also unintentionally wore a shirt with a pig on it the day I visited the café, fate?). The café not only has a unique name (it’s not a typo) but it also serves distinctive dishes, traditional café food with an Asian twist. Blaq Pig doesn’t look like a café that would make beautifully smooth Green Tea Lattes ($5) and tall, crisp Iced Green Tea Lattes ($6). 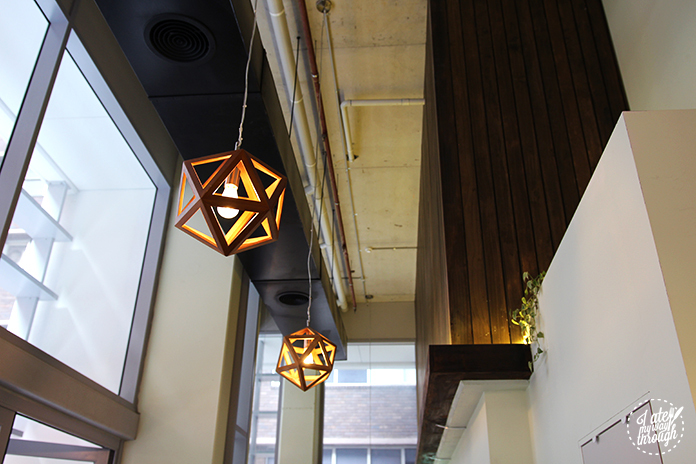 But don’t judge a cafe by its décor because they certainly exceed your expectations. We ordered a Green Tea Latte with no sugar (because I like the bitterness of matcha). It was as smooth and creamy as it looked. 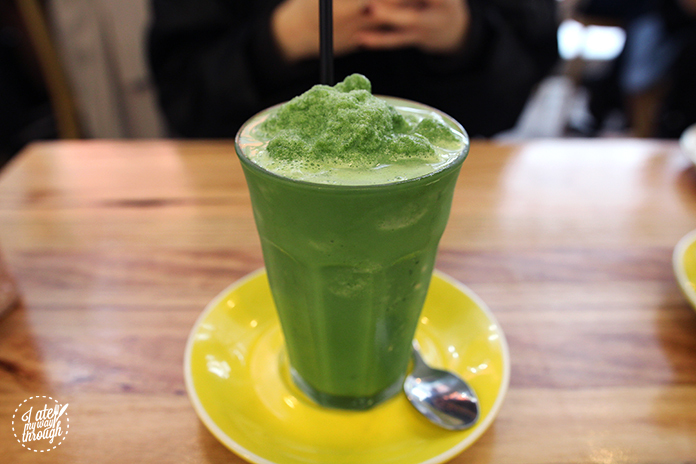 It was like sipping on a lush, green velvet carpet. We also got the Iced Green Tea Latte with sugar but it wasn’t overly sweet. 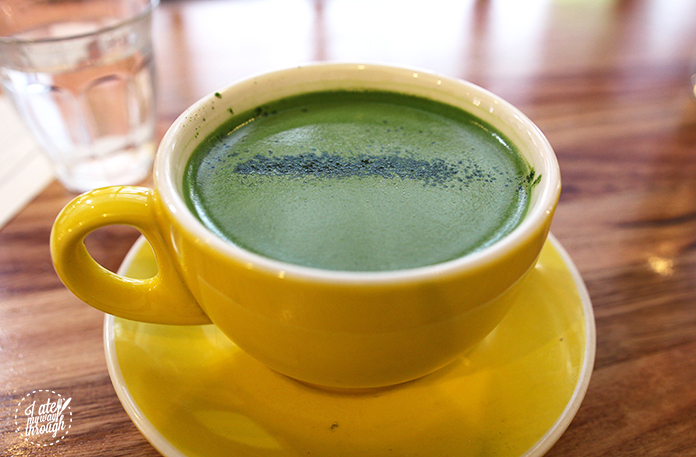 It had the perfect amount of sweetness that didn’t overpower the prominent flavour of matcha. The Iced Latte was more like a frappe than a latte which is great for when you’re craving a refreshing, cool beverage with a hit of caffeine. 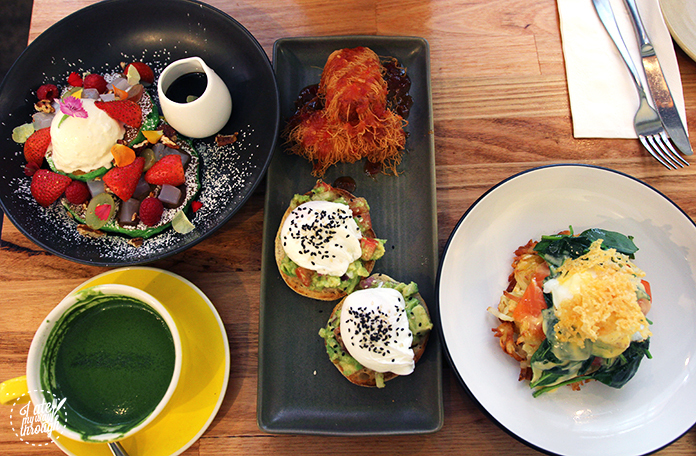 Everything on the menu looked so alluring, but we initiated some self-control and ordered the Angel Hair Halloumi ($17), the Potato Hash ($17) and the Pandan Buttermilk Pancakes ($16). 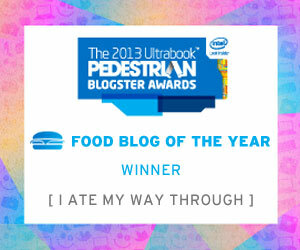 Ok, maybe our temptation won out in the end but we tried. The Angel Hair Halloumi was truly other worldly. 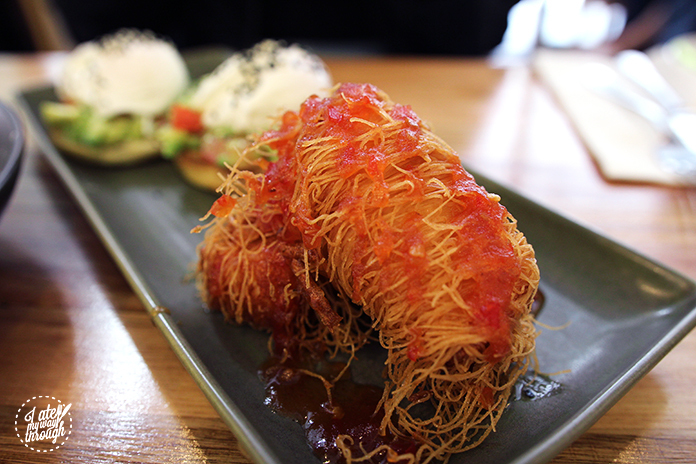 The salty halloumi was covered in thin noodle-like batter and deep fried until crispy. It was covered in a sweet and spicy sauce that added flavour and depth to the batter. You first bit through the crunchy, golden batter and then you reached chewy saltiness of the halloumi. It was like having deep-fried halloumi but with extra crunch. 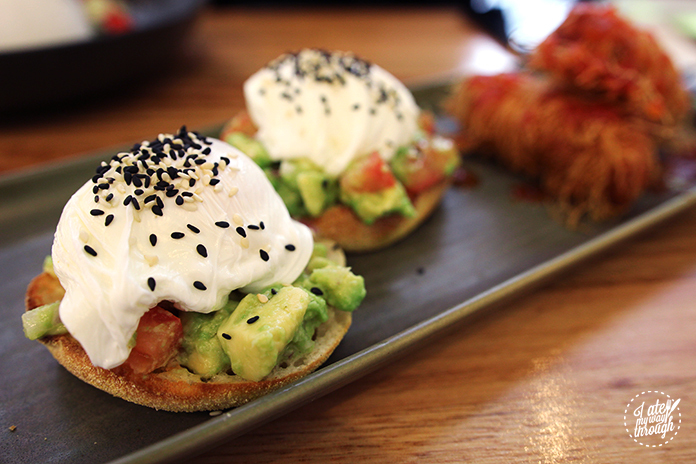 The halloumi was served with silky poached eggs and avocado and tomato salsa on top of a lightly toasted English muffin. With this dish, you can get the best of both worlds (cue Hannah Montana) between fresh and light, and salty and crispy. The Potato Hash is for those who are looking for something a bit heavier. You can get smoked salmon or smoked bacon with the dish (we opted for smoked salmon). The Potato Hash was a mountain of carbs, protein, iron, more protein and crispy, cheesy goodness all drizzled with a sweet hollandaise sauce. 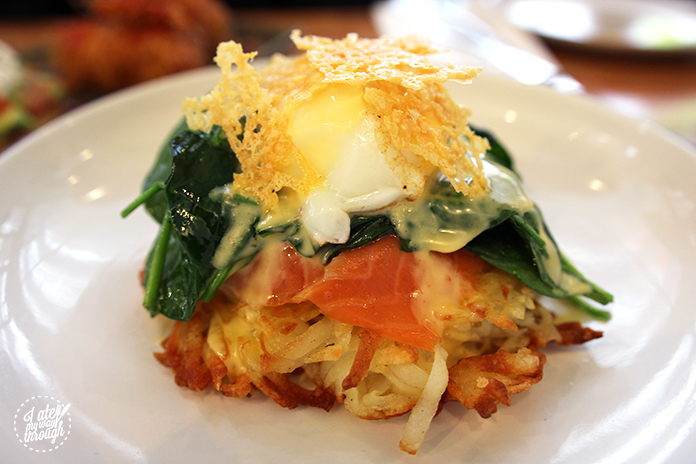 Blaq Pig’s version of a hash brown is a little healthier than your typical hash brown. Instead of it being deep-fried, the potato hash is baked until golden brown. It proved to be a great base for cleaning up the mess you will make after destroying this mountain. The lightly fried egg on top contained golden, flowing yolk inside. The sautéed spinach soaked up the hollandaise sauce and allowed you to convince yourself that you’re being healthy. The Parmesan crisps added a nice texture to the dish and putting cheese on anything is always a good idea. The smoked salmon was a little salty so have it in moderation with the rest of the dish. My ‘green’ diet was going well. Started off with a Green Tea Latte, had some avocado with my halloumi, a few leaves of spinach with my potato hash and now onto the very green Pandan Pancakes. 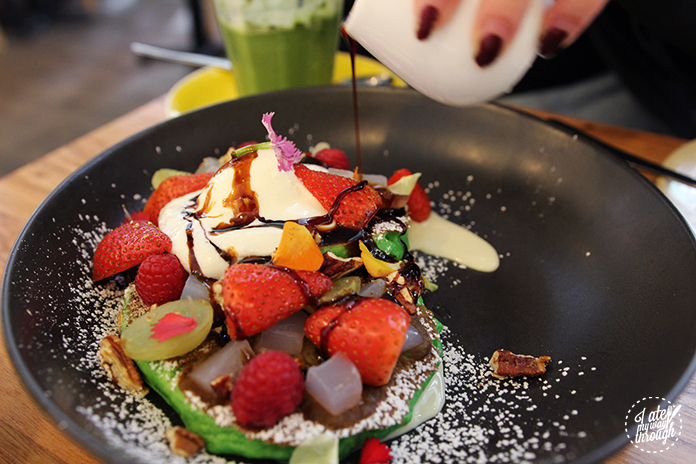 I’m sure you have these picturesque Pandan Buttermilk Pancakes floating around before (on Instagram, not in mid air). The sweet, fluffy buttermilk pancakes are pan-fried until golden and then topped with fresh berries, nata de coco (jelly made from coconut water), crunchy pecan crumble and smooth coconut ice cream. To top off this already photogenic meal, edible flowers are delicately placed among the dish and then dusted with icing sugar. Drizzle some salted coconut sugar syrup on the pancakes and congratulations your ‘green’ diet is on track. The pancakes were moist and light, allowing it to melt in your mouth. 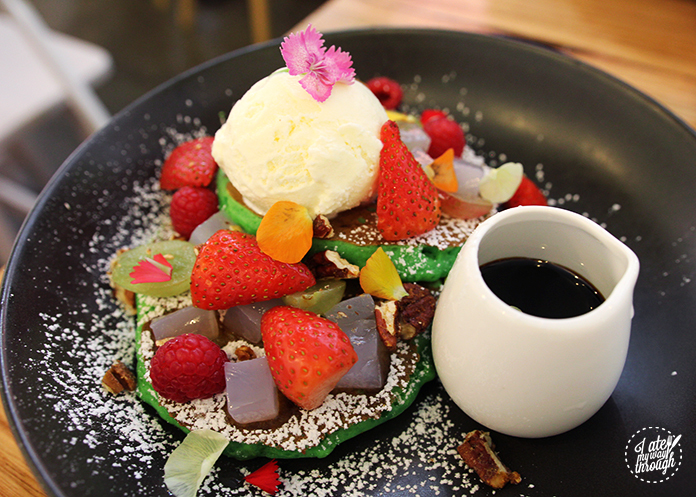 The coconut ice cream complemented the dish as its creaminess was absorbed into the pancakes. The nata de coco and pecan crumble added a range of textures to the dish which kept your palate entertained. For those who don’t have a massive sweet tooth, a little drizzle of the coconut sugar syrup is enough, but if sugar is your thing, go nuts. 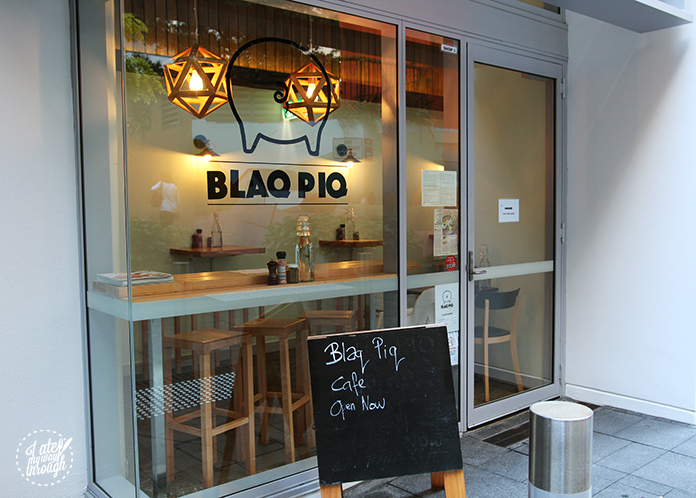 Blaq Pig is just as unique as its name, offering a variety of dishes that will excite your tastebuds. If you’re ever looking for something different from your usual café food, Blaq Pig is the dark horse of Sydney’s café scene. Next articleWine Island: a grape lovers’ paradise!